Dear God, these are anxious times. Tonight for the first time I lay in the dark with burning eyes as scene after scene of human suffering passed before me. I return to you, again and again, especially when humanity collapses into fear after the atrocities of terrorism. Like now. Paris. Lebanon. Syria. Tel Aviv. The young faces of victims. Grief, fear, trembling, bleak presentiments. You, of all people, understand. Mortal fear in every fibre. Complete collapse. Lack of self-confidence. Aversion. Panic. During times like these, it is as if the very Soul of the world stretches out across the universe in cosmic mourning. We share in the shock, the brutal searing of goodness; it feels like a frigid, howling wind that penetrates what few layers of protection we have managed to put on. And finally: ought we not, from time to time, open ourselves up to cosmic sadness? You know about “cosmic sadness,” don’t you? You know intimately about Terror, dear Etty, and about the great fear that penetrates our souls in times like these. But you were, unlike me who sits in safety, at the very center of that Great Evil. And yet, against all odds, you blossomed. Auschwitz may have claimed your body, but nothing could touch the beauty of your soul as witnessed in your diaries—that intimate portrait of an expanding soul. For that, I am grateful. You, like your young counterpart Anne Frank, who penned her own diary only a few blocks away from you in the beleaguered city of Amsterdam, are part of that Great Feeling that gives me faith in life again. And beauty, especially beauty. 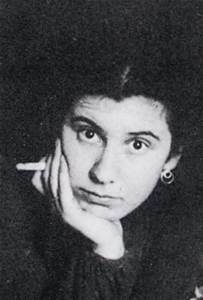 Like the birth of things, of children, plants, opening buds. . . .
To read the entire post “After The Terror . . .” and see more photos of Etty Hillesum, click here.